One of the main reasons retaining walls are built is to keep water away from a specified area and keep the area (for the most part) dry. Water can cause the structural integrity of a retaining wall to degrade, which means it is of the utmost importance to keep the reinforced area relatively dry throughout the construction process. But, as anyone who has ever attempted water management on the job site knows, sometimes this can feel like an impossible task. It’s important to consult with a site civil engineer to determine what the best drainage solution will be. Weep holes are a series of holes 4 to 6 inches in diameter placed every 3 to 4 feet along the retaining wall. These holes allow a small section of drain pipe to route through the wall and allow water to pass through. Sometimes, the area below the weep holes can become stained, as dirty water filters through and down the wall. If aesthetics are a concern, filter fabric can be used to cover the inlet and filter the dirt before the water flows down the wall. You can eliminate the need for weep holes by using a perforated pipe in a bed of gravel behind the wall. The gravel allows the water room to percolate towards the bottom of the wall where it enters the pipe and is carried away from the retaining wall. At the ends of the pipes, you can either connect them to another drainage feature or let the water flow onto the ground as needed. If the wall is under 3 feet, drainage may not be required so long as the retaining wall itself is not completely impermeable. Retaining walls not held together with mortar will have enough space between each stone to function as natural weep holes. Filter fabric will need to be installed behind the wall to keep soil from escaping with the water. The best way to begin planning for water management is to consult your site civil engineering firm to gain a thorough understanding of the site, determine where water will come from and how to properly manage it. During their design process, your site civil engineering firm takes into account all sources of water above and below grade. It’s up to the contractors to understand the intent of the approved site plans and what will be required to protect the area impacted by the wall construction. By working together, the contractors and the site civil engineering firm will evaluate the entire site to determine if the water will drain into the area where the wall is being constructed and the most effective solution. It may be determined that berms or swales are needed to direct water away from the construction site as a temporary form of water management. There may also be a need to employ temporary grading, as retaining walls are often built before the site has been completely graded in its final configuration. This will ensure that water does not drain towards the construction area. Water that occurs within the soil, known as groundwater, presents its own set of problems that must be taken into account and planned for. Infiltration, water table fluctuation, and differing layers of permeable soils can cause movement in the soil and reduce the structural integrity behind the retaining wall. If your retaining wall is near a pre-existing storm sewer, it may make sense to use drain pipes in toe or heel drain applications—properly vented a minimum of every 50 feet—and drain directly into the sewers. Alternatively, you may be able to vent to a lower elevation on the site, but check approved plans for locations first. When venting to a lower elevation, make sure all drain locations are properly marked and protected during the construction process to ensure no damage or blockage occurs post-construction. Rodent screens and concrete collars are great ideas to keep the drainage pathways clear of debris. 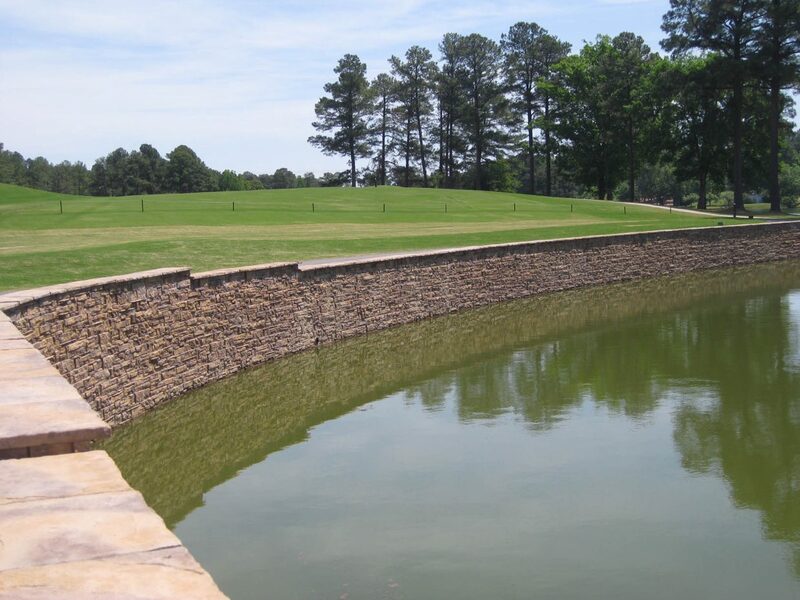 Groundwater is not the only water management concern to take into account when planning for a retaining wall. Prior to construction, the general contractor and site civil engineer need to work together to identify all potential sources of concentrated water. These sources can include: below-grade storm sewer pipes, water lines, water mains, fire hydrants, roof downspouts, sump pump outlets, irrigation systems, and more. Other concerns that could cause unaccounted water sources include: parking lots, grading of the site, catch basins to storm sewer systems, driveways, and slopes above the walls. During the building process, rainwater can impact your build in ways many forget. Materials and soils left out in the rain can become saturated and unusable. It’s good practice to cover all infill soils and the entire retaining wall project if the weather forecast is calling for rain.